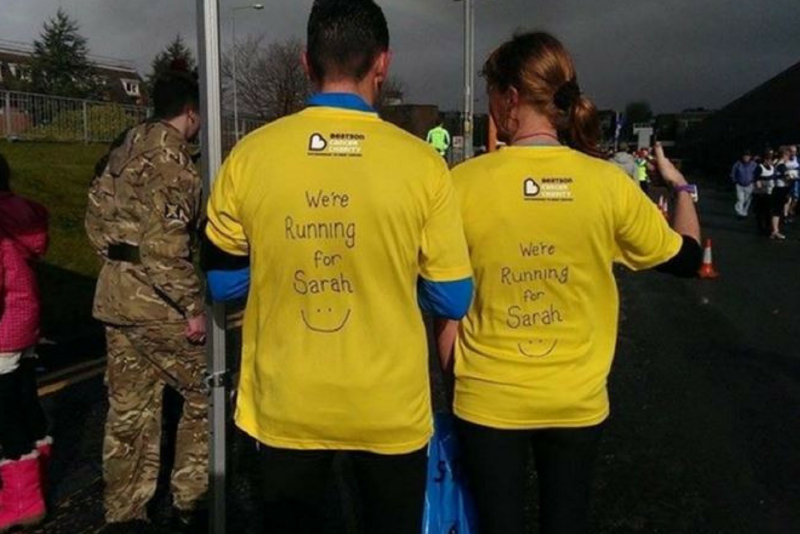 So two of our brave Directors decided in December 2014, to train for a half marathon in order to raise money for the Beatson Oncology Hospital. (The Beatson West of Scotland Cancer Centre is a specialised cancer care centre in Glasgow, Scotland). The directors in question Campbell & Jacqui had ran previously, Jacqui completing a couple of half marathons in the past for charity. This was however Campbell’s first half marathon and as he hadn’t being running much prior to the decision, it was a big undertaking. 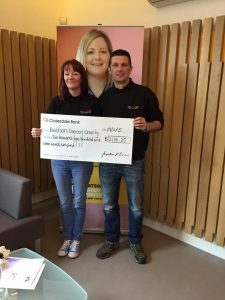 After the heart-breaking news of a close friend’s cancer diagnosis they decided they wanted to try and help in a positive way, and as their friend was receiving care and treatment at the Beatson, they decided that was where the funds raised should go. The first step was to actually register then await the fundraising packs. Campbell & Jacqui had decided on a “just giving” page in order to receive any donations. Then the hard work started…….the training. Now as you are possibly aware the winter in Scotland, particularly on the west coast, during January and February is positively Baltic. We are talking icicles forming on your nose, kinda cold. But as hardened athletes took up the challenge with gusto. They had the office in hysterics at the stories of their evening training runs. Especially the one where they were out running at night, so its black as black outside and a country road they ended up on had no street lights what so ever. They couldn’t see a thing (highly dangerous of course) so they had to wait until every time a car passed and use the beam from the cars headlights to progress a bit further. Needless to say the run took them a very long time that night. The following day, head torches were purchased, and it was game on again. 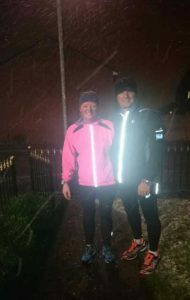 The weather took a turn for the worst and they were pictured running in the snow, all the time though their just giving page was picking up memento. Here is a copy of what they had wrote on their fund page, they had set the initial target to raise as £1000.00 a tall order but they were determined to get there. 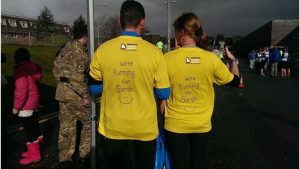 “Campbell and I are running this half marathon to raise as much money as possible for an amazing and worthwhile charity. Most of you know our good friend and know of her lengthy fight with the dreaded C. She recently spent a week at the Beatson receiving treatment and during her time there she spent a lot of it up in the family chill out room. I was taken up to visit this room and I was so very impressed. It’s a beautiful tranquil area for families, patients and children to visit their loved ones, taking them out of a hospital looking environment. It’s a perfect chill out spot for the patients, offering free refreshments and an array of treatments in the fantastic treatment rooms. Anything from a massage to getting your hair cut. It’s all free, provided solely by fundraising by the charity. We don’t know about you, but personally we can count on both hands people we know who have been affected by cancer. Brave souls like our good friend who still have a daily battle to fight. Friends and family who thankfully have been given the all clear, and sadly those who didn’t make it. This charity is for all of us and our friends and family should we ever face this terrible, terrible illness. So the donations came flooding in. Emails were sent to local businesses and they didn’t disappoint. The response from several local businesses was outstanding. Several of our large suppliers also donated, enabling the fund raising page to continue to grow. The day of the race finally dawned and Campbell & Jacqui crossed the finish line in just over 2hrs. It was an emotional finish, as their friend for whom they were raising the funds on her behalf was at the finish line to cheer them on, along with her family. They finally received all their donation’s and between them, had managed to raise an incredible £2116.25 including the gift aid.